Like most layouts, the design of Laramie Engine Terminal went through many iterations before the final version was reached. 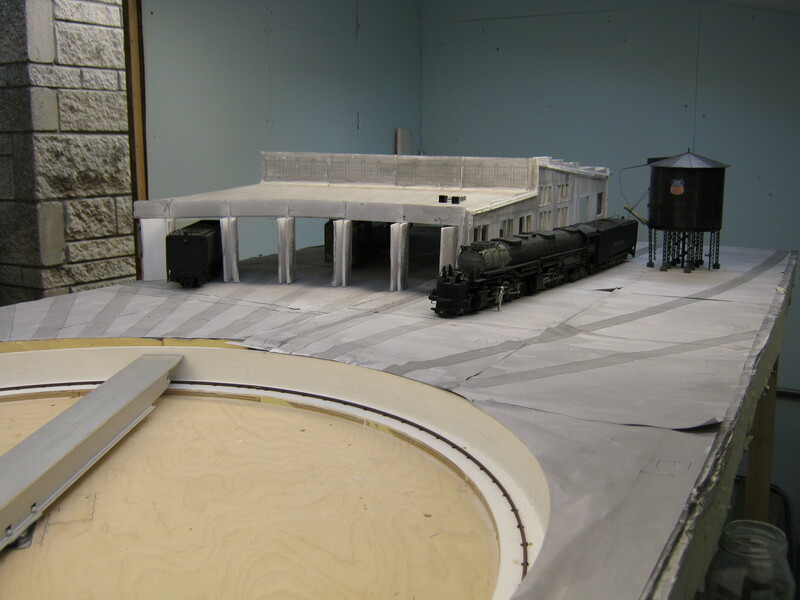 Having decided that the layout was to be built in O-scale and that the key features were the inside of the roundhouse, the turntable and the coaling tower and having already gone through many versions on CAD, I decided the only thing to do was build a full sized mock-up to ‘see what it looked like’. 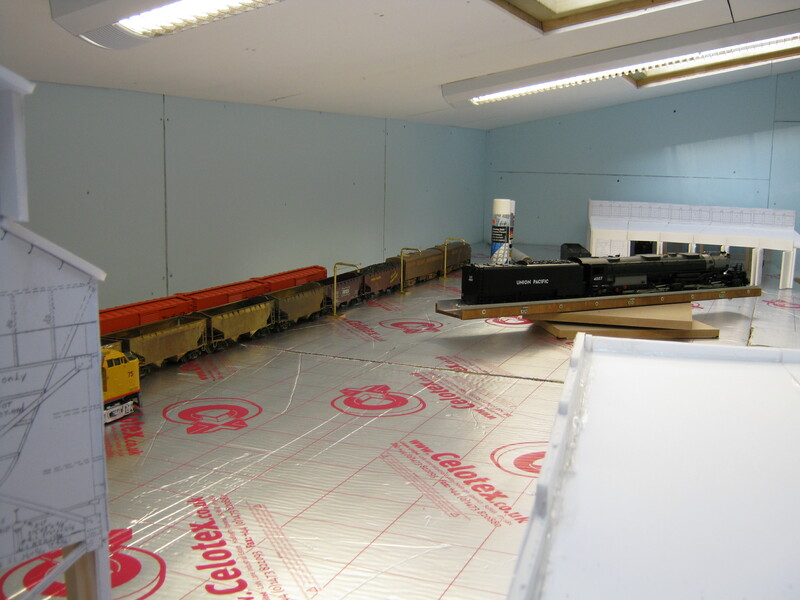 Celotex insulation sheeting was used as temporary baseboards (delaying the insulation of our roof space by a month or two!) 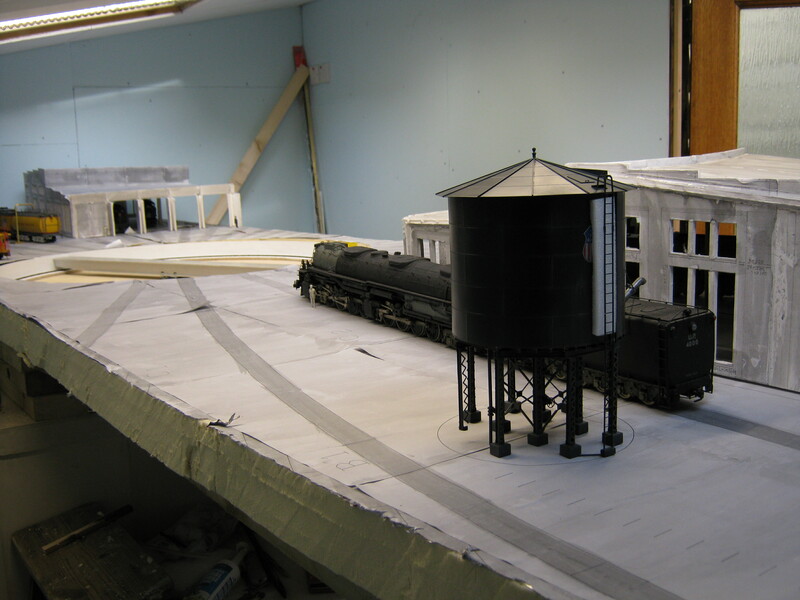 and, since at this stage none of the buildings or the turntable had been built, they were mocked up using a ‘lazy susan’ ball race for the turntable and foamboard for the buildings. This version included a section from both ends of the roundhouse (three full lanes and 3 part lanes from the longer ‘Big Boy’ end – lower photo – and four full lanes and 2 part lanes from the other end – upper photo). The coaling tower was the full sized Laramie coaler with 4 locomotive coaling lanes and a hopper track. 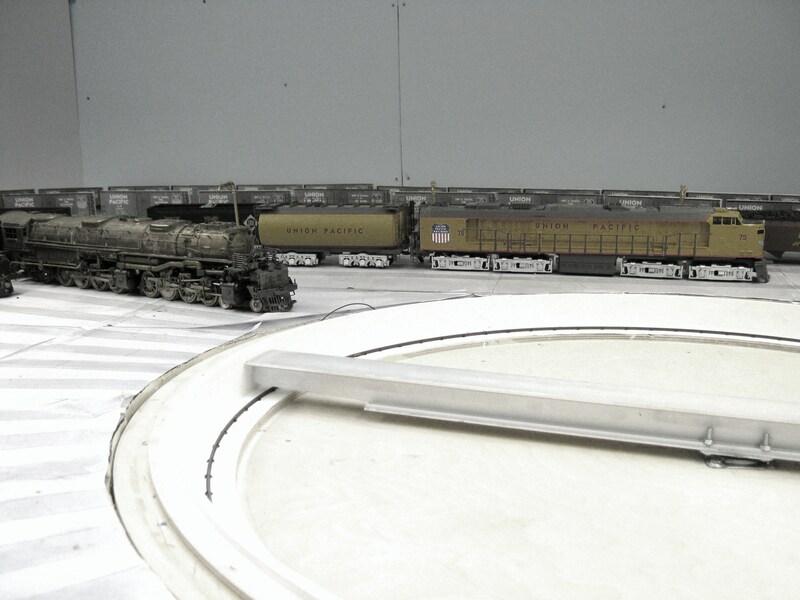 Three tracks were included at the back of the layout, one to act as a diesel/turbine refuelling lane (see oil fillers and aerosol can acting as the diesel fuel tank) and the other 2 to be filled with hopper wagons and box cars to act as a 3-dimensional backscene. At this stage it hadn’t occurred to me that it might be better (or even possible) to view the layout from both sides – it was still a very traditional ‘view from the front’ design though with the added interest of views into the roundhouse. Already the design was quite large (not meeting my design criteria to be able to be transported in my car!!) 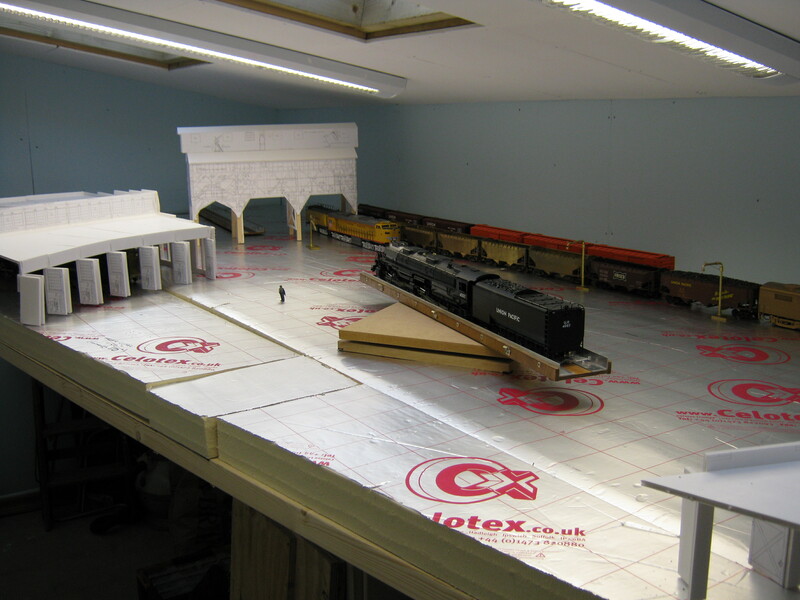 at about 15ft long and just under 5ft wide without fiddle yard/staging!. The plan was to have a backscene depicting the townscape of Laramie which would produce a great scene with real depth but at the expense of further increasing the width of the layout. By now it had occurred to me that, at this width, problems of access occur – derailments or engines stalling towards the back of the layout (particularly in the middle) would be hard if not impossible to reach. So, on several counts this design, despite looking good, didn’t really work. The tracks running the full length of the layout (initially in O-scale but later in O, HO and N) have gone. 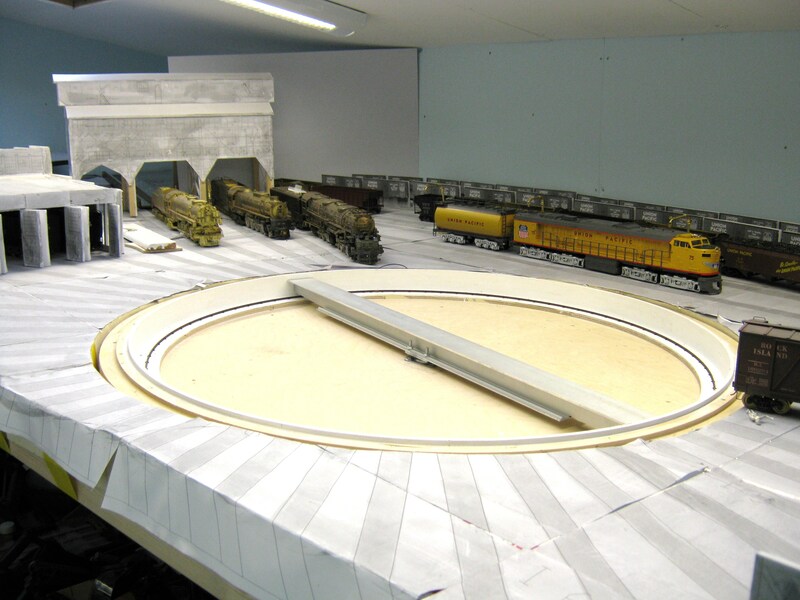 Both ends of the roundhouse have been narrowed by one lane – the thinking being that this saved about 6″ in baseboard width without any real loss visually or operationally. The layout was now a much more manageable width – less than 4ft and with access from both sides so everything is now within easy reach. The layout was still quit long (15ft) – was there any way of making it shorter to emphasise the size of the engines without loosing anything visually or operationally?